If you&apos;re like me, you probably find fascination in all aspects of boats, their systems, and everything related to them. Recently, I have been particularly intrigued by the notion of hydraulics and hydraulic power, for use aboard a trawler. Have you ever sat and watched a road crew move large or heavy material, or dig out rocks as big as VW beetles? Of course you have, as children we all did exactly that whenever those big yellow machines rumbled into view. This curiosity isn&apos;t new. Galileo. Archimedes. Leonardo da Vinci. Evangelista Torricelli. Daniel Bernoulli. The men who formed the basis for modern science. Each of them was an insatiable knowledge-seeker. Collectively, they jumped us far ahead in our understanding of the universe. And these men too were interested in water and the role of fluids in the world. They didn&apos;t own trawlers, but don&apos;t hold that against them. After all, it was a long time ago. Their work led to the study of hydraulics, which is the study of liquids and their forces. It goes back a long way indeed. In fact, it was Archimedes who first developed the concept of buoyancy and displacement, back in the third century, BC. More and more, we&apos;re seeing hydraulics in the trawler lifestyle. Cruising generators, active fin stabilizer systems, windlasses, dinghy lifts, bow and stern thrusters, get home drives, steering systems, main propulsion systems-all play an active part in making our boats safer, more comfortable, and easier to operate. It isn&apos;t new technology...far from it. Hydraulic systems have a long history in commercial and military applications. But for many, the use of hydraulics aboard husband-and-wife-sized motorboats is a new concept, a new direction. And for them it represents an information abyss, a seeming black magic mystery of hoses and metal boxes. It just somehow works. Because it can&apos;t be compressed, a confined fluid is incredibly strong, can be minutely adjusted in any direction, yet is still easily controlled. Watch the operator of a large backhoe adjust and flip large rocks weighing hundreds of pounds, and you can see both the dexterity and sheer power offered by hydraulic systems. Most marine applications use small, easilyinstalled components, with hydraulic lines run through the boat. Properly engineered, hydraulic systems can be stalled without damage, are reversible, and offer a lot of usable power when integrated into a multi-function system. I&apos;ve seen some pretty slick hydraulic systems on even some small trawlers (less than 35&apos;), and the owners are happy as can be in the performance and versatility. When the decision is made to add an active fin stabilizer system, windlass, dinghy crane or powerful thruster to aid maneuvering, the trawler owner has all sorts of choices and options in today&apos;s market. But it is important to make the right decisions during this process, and knowledge is the key to success in marine hydraulic systems. True, you&apos;ll depend on professionals to engineer and install these systems, but knowing something about hydraulics will go a long way towards taking the mystery out of this subject. Besides being able to maintain these systems properly, you&apos;ll be a more-informed boat owner when you consider the option of hydraulics for your boat. And make no mistake about it, an educated trawler owner is a formidable entity in the equipment marketplace. Despite the early work in hydraulics, it was not until a Frenchman came along in the 1650s, Blaise Pascal, that the world got a more definitive appreciation for the role water and fluids play in the world. Pascal was first to establish the principle of hydrostatics today known as Pascal&apos;s Law. It is the key to knowing how hydraulic systems work, whether it is steering, fin stabilizer system, bow thruster, or commercial fishing-net roller. Sound complicated? Actually, it isn&apos;t.
Look at the diagram. You see a pipe with a cross-sectional area of 1 sq. in., connected at the same level to a larger pipe with a cross-sectional area of 5 sq. in. If a plunger presses down on the column of fluid in the smaller pipe with a force of ten pounds, let&apos;s see what happens. As fluid is non-compressible, the pressure (in pounds per square inch, or psi) exerted by the plunger is calculated by dividing the force (of 10 lbs.) by the area of the pipe (one square inch). This determines the pressure to be 10 psi. Pascal&apos;s Law states that pressure is transmitted instantly and equally throughout the rest of the system, so let&apos;s look at the other end of this circuit to see the results of this 10 psi pressure. The fluid in the larger pipe is affected by the 10 psi, and we use the same formula to determine that the 10 psi pressure (times the larger area of 5 sq. in.) creates a force of 50 lbs. as a result. Due to the design of this system, that force is directed upward. A 10-lb. downward force creates an upward force of 50 pounds. Pretty cool, huh? That&apos;s Pascal&apos;s Law in action. It&apos;s also the basis for all hydraulic systems, and can be harnessed to accomplish a great deal of work for you onboard your trawler. Speaking of work, there is one other point to mention here. In order to get any useful work out of a system, you must put the same amount of work into it. Simply put, "work in = work out." The apparent inequity between down and up force in our example is compensated for in distance traveled. What this means is that, to raise the fluid in the larger pipe one inch, a plunger in the smaller pipe must be pushed down five inches. This example is exactly how a hydraulic jack works, with a small cylinder pump able to generate the force necessary to slowly lift a heavy object at the other end of the jack. This is about all the theory you need understand to appreciate the strength and versatility of hydraulic systems. Generally speaking, all hydraulic systems have the same system elements, whether they are used for windlass, fin stabilizer system, get home, steering, or thruster applications. They include pump, tank and filter, lines, controls, and output device. Many systems also include a heat exchanger for cooling the fluid, and a distribution manifold (more on that later). There are three basic types of pumps found in hydraulic systems. The simplest is the gear pump. It consists of two gears in a housing, one of the gears being driven by an outside power source. As you can see in the drawing, if the space between the gears and their teeth is filled with hydraulic fluid, the action of the two gears will drive the non-compressible fluid in one direction or the other. In a simple steering system, you are the power source, turning a steering wheel attached to a gear pump-which in turn extends or retracts a piston attached to your rudder. If you think of a simplistic application where two gear pumps are connected by lines with no valves, as one pump turns, it drives the other, since the increased pressure of the fluid has to go somewhere. In such a circuit, the "other" pump is now a motor. This is a basic example of a pump driving a hydraulic motor. The second type of hydraulic pump is the vane pump. It is often used for fixed displacement (rated flow) applications. As the teeth in gear pumps eventually wear out from constant contact, the beauty of the vane pump is that it actually gets better with wear, the vanes seating more closely within the pump housing. Both gear and vane pumps create pressure and flow whenever their power source turns them, so a clutch is often fitted when the power source needs to run for other purposes (as in a genset), and hydraulic demands are idle. The third (and more expensive) type of pump seen in marine applications is the piston pump. The piston pump offers the advantage of variable output, from zero flow to full forward to full reverse, and everywhere in between. The piston pump has an internal swashplate to control GPM and direction of flow. When the swashplate is set to neutral, the pump will run continuously with zero flow. This makes it the pump to have if it is to be mounted directly to an diesel engine&apos;s PTO. For reasons of long service life, and suitability for marine applications (other than steering systems), the most commonly used pumps in marine hydraulics are vane and piston pumps. The basic system also includes a reservoir tank, and a filter of some kind to provide the pump with an uninterrupted supply of clean hydraulic fluid. Many trawlers have hydraulic steering, and the pump and reservoir might be an integral unit. Larger systems, as found in fin stabilizer and thruster applications, would have a tank mounted separately from the pump. Flexible hoses are often seen in hydraulic systems, although, when a long run does not require flexibility, stainless steel tubing is a better choice for permanent installation. Either way, it&apos;s important that the burst pressure of these lines (hose or stainless steel) is more than adequate to take the maximum pressure generated by the system. Anything that might cause pressure to build beyond designed limits, such as a thick piece of wood caught in a thruster tube, will force the excess pressure to escape through a relief valve installed for just this purpose, the relieved fluid routed back to the main tank reservoir. Some output devices, such as a powerful thruster, create heat in the system, so heat exchangers are included into the circuit to cool the hydraulic fluid. Output devices, often called actuators, do the actual work. Whether it&apos;s an actuator on a fin stabilizer, a motor turning a chain drive over the propeller shaft as a get home system, a thruster motor for docking, a motor winding chain around a windlass drum, or a ram alternately pushing and pulling the boat&apos;s rudder, this is what justifies the system. One of these devices, or any combination of them, can be used aboard your trawler. But all these separate hydraulic system circuits can make for great complexity in a boat. That&apos;s where integrated hydraulics comes in. A major improvement in hydraulic systems is the attitude towards integration. In the past, all of these hydraulic devices could be found aboard a yacht, each with a pump, tank, motor, lines, valves, and controls. But if you take a simple system and multiply it several times throughout the engine room, you&apos;ll have a nightmare. That is the motivation to integrate as much as possible. It&apos;s quite feasible to design a hydraulic system that uses a single pump to run multiple devices, all controlled with a single network of lines and other parts. But, unless you have designed the system to do all of these things simultaneously, you may be able to bring the dinghy aboard just fine, but perhaps not at the same time as hauling in the anchor. And don&apos;t even think about also using the thruster, because it won&apos;t have the GPM flow to generate proper thrust. Multiple devices can be run off a central distribution manifold that takes the single pump&apos;s full operating output and routes it to the output devices as the operator&apos;s controls dictate- also reducing the flow at the same time, to match the requirements of the individual actuators and motors. A 30 GPM flow can therefore be successfully directed to the bow thruster, then a muchreduced 8 GPM flow to the windlass when the thruster job is done. A dinghy crane may only require 5 GPM, and fin stabilizers typically need flow in the order of 6 GPM. This ideal, one-pump system is not usually considered the most practical, however, and for good reason. If you look at the different tasks being asked of the hydraulic system, you see they can be broken into two categories: those that operate continuously under way, such as fin stabilizers or a cruising generator, and those more infrequently used, such as a bow thruster, dinghy davit, or anchor windlass. The system designer takes this separation of tasks and integrates the power demands into a system schematic that accomplishes the real world needs of the boat. As a result, there may be one small pump on the main engine for under way applications, and a larger pump on the genset for less frequent tasks (the larger pump being specified for the higher demands of a thruster). Either way, a properly-designed integrated system uses a minimum of pumps and hoses, avoiding the nightmare of complexity. The biggest problem that can happen to a hydraulic system is not a leak. Nope, not even close. Leaks are not a necessary evil, nor are they to be expected. Properly installing and seatrialed, leaks should not happen. Ever. No, the big problem is contamination. Contamination of the hydraulic fluid is most likely to occur during installation, or during filter changes (around 2,000 hours). That is when foreign materials can get into the system, gumming up the works or clogging the system. Contamination should be avoided by simply being careful when working around the insides of the system. Keep the filter(s) clean, and the fluid cool. If the job is done properly from the beginning, there should not be much more to do than that. Hydraulics don&apos;t need any attention on a regular basis, and the fluid isn&apos;t like motor oil that must be changed regularly. In fact, beyond replacing what is removed during filter changes, the fluid in the system is permanent. I suppose the other gremlin isn&apos;t really a gremlin, but is worth mentioning...cost. Hydraulics cost more to engineer and install than other alternatives, and it takes careful examination to determine just where the threshold may be to justify hydraulics. For example, you can hardly rationalize the expense of a big, hydraulic bow thruster if that is the only hydraulic device aboard your yacht. A 12VDC system may work almost as well, and cost far, far less. But once you consider adding a get home drive, or purchasing fin stabilizers, then you might also look at your windlass needs, and/or a dinghy crane. Indeed, when you add several of these applications together, hydraulics are put in a new light, and begin to make more financial sense. In case you haven&apos;t figured it out by now, most hydraulic applications are beyond the scope of do-it-yourself projects, although many of the components are readily available through hardware and industrial supply companies. Making the system work as simply as possible, and as efficiently, requires a professional to engineer the system. There are many factors to consider, and it takes an engineer to do it right. That&apos;s not to say you can&apos;t do some of the planning by yourself, but if you aim for an integrated system that performs multiple functions, it&apos;s best to let a professional put it together. But that&apos;s not to say every trawler requires a custom, one-off system. Absolutely not. Many of these system designs have become so standardized that they require little additional engineering beyond sizing pumps and control valves, which themselves are often standard. 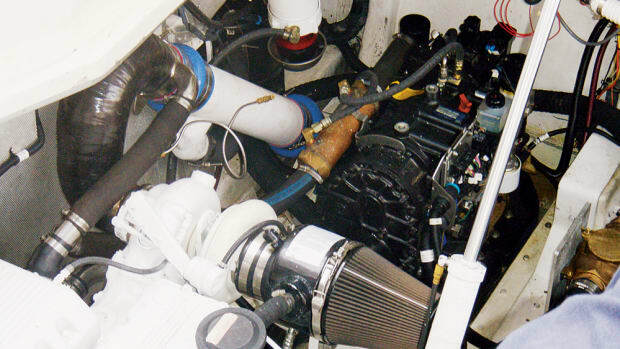 If you want hydraulics on your boat, do it right and have a professional design the system. Your money will be replaced with performance and peace of mind. Hydraulics systems are a very reliable way to make things happen on your trawler yacht. All of the actual applications have been around for ages, and the technology is tried and true. Even in third world countries, hydraulics are better understood, and more easily serviced, than your electric coffemaker. Until now, the price has kept the power of hydraulics out of the trawler market, but perhaps that&apos;s changing. While still expensive, there is a growing move towards active fin stabilizers for the comfort of the crew. And other devices are gaining popularity. If you know hydraulic basics, you&apos;ll be much more educated when you consider using hydraulics aboard your boat. You will also be better able to talk with marine product reps at boat shows. He or she can then answer your questions, discuss your ideas, perhaps even put together a system that works on your yacht. I want to thank the folks at Naiad Marine Systems for their help in researching this article. They opened their doors to us, and showed us all things hydraulic. I want to especially thank Anthony Cannella and David Yish, two engineers who have the gift of explaining complex issues at a crayon level. They were especially helpful. Thanks guys!